Are you washing your car, or just damaging the paint? Most of the swirl marks that disfigure your vehicle are likely caused by poor washing technique. Thorough weekly washes and careful hand-drying can be the best care you can give your vehicle. Improper techniques will cause unsightly swirls and scratches in the paint requiring compounding or polishing at the very least. You can eliminate these problems and save yourself extra work by following a few simple tips when washing and drying your vehicle. Are you washing weekly or weakly?Weekly washing is best because some contaminants quickly do serious long term damage to paint if they are allowed to remain. Two such organic compounds are bug remains and bird droppings. These bio-hazards contain complex proteins that bond to the surface and organic acids that penetrate and break down the surface, eating into your clear coat if not removed promptly. Weak spots in the clear coat make your vehicle susceptible to corrosion and discoloration. Another problem contaminant is brake dust. It contains metal shavings from the rotors and adhesives used in the production of brake pads. Try to picture the dirty plume of brake dust and roadway chemicals that travels along with a moving vehicle. This fog of chemicals shower the lower portion of your vehicle with a clinging, nearly invisible mist. Brake dust itself, is highly corrosive and very sticky. Washing your vehicle weekly will remove these contaminants before they have the opportunity to do unsightly permanent damage. First Never wash in direct sunlight. Pick a shady spot. Second it’s very important to choose tools that are gentle on the paint, yet still effective at removing contamination. As a rule of thumb, sponges and mitts that are plush or have a deep nap are better than flat weave towels or dense sponges. For example, a Natural Sea Sponge has numerous deep compartments where dirt and debris can accumulate. The natural fibers themselves will not scratch the paint and they will essentially pull contamination into the sponge’s openings, away from the paint. Always use the softer side of the sponge for washing. Rinse new sea sponges thoroughly before use to remove any shell fragments or sand. Another option is a Sheepskin Wash Mitt. Sheepskin is extremely soft and plush. The fibers are gentle on the paint while the nap is deep enough to accommodate loose dirt and sand so they do not rub against the vehicle. Because wool is natural, it does not last as long as a Microfiber mitt.However, for luxurious softness, you can’t beat the texture of wool. 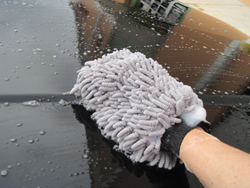 Micro-chenille wash mitts are another paint-safe option. Microfiber’s combination of polyester and polyamide make it capable of scrubbing the paint without scratching or swirling. It traps dirt and grit within the fibers rather than leaving them on the surface of your vehicle. Be sure to rinse the mitt frequently to release these particles. 1. Wash the wheels and tires first. If you splash wheel cleaners or dirt onto your vehicle, you can simply wash it off as you wash your vehicle. Use a cleaner that is safe for all wheels, like Wolfgang Tire & Wheel Cleaner. It is water-based and has no corrosive chemicals, which is safer for coated wheels and rubber. Agitate with a wheel brush to clean wheels without scratching. Wash each wheel and tire one at a time and rinse thoroughly before moving on to the next one. NOW EMPTY AND RINSE ALL CLEANING MATERIALS including your Pinnacle Safe Scrub Bug & Tar Sponge and your wash bucket. 2. Now you’re ready to wash. Let’s start with clean water and a freshly rinsed container and our Micro-chenille Wash Mitt. It’s important to use a car wash that is rich in lubricants. The purpose of the car wash is to remove contaminants and lubricate them so they do not scratch the paint as they slide off the vehicle. Dish detergents are not ideal because they remove protective coatings. P21S Bodywork Conditioning Shampoo,McKee’s 37 Power Wash and Pinnacle Bodywork Shampoo are all fantastic choices. They do not remove wax and provide ample lubrication of gritty particles. 3. How do you prevent swirl marks? Use two buckets. Fill one bucket with soapy water and fill the other with clean water. Each time you’re ready to reload your sponge with soapy water, dip it in the clean water first, to rinse out the grit and contamination you’ve just removed from your vehicle. Then dip it in the soapy water and continue washing. An even better option is the Grit Guard. This plastic grid sits in the bottom of a 5-gallon wash bucket and stabilizes the water. Contamination and particles settle to the bottom of the bucket and the clean wash water remains at the top. 4. Always rinse your vehicle thoroughly before you begin washing in order to remove loose debris. Then begin washing at the top of the vehicle. Wash down the vehicle as opposed to front to back. Remember that the lower panels are dirtiest. You want to clean the windows and the upper panels before cleaning the lower half of the vehicle so that you don’t transfer grit to the top half of the vehicle. Rinse and reload your Sponge often to prevent cross-contamination. Rinse your vehicle frequently as you work, especially in hot weather. For stubborn spots, like bugs or tar, use the Pinnacle Safe Scrub Bug & Tar Sponge to gently remove sticky contaminants without scratching. To soften the sponge, soak it in warm water for 3 minutes. Always use it with soapy water to lubricate the sponge. If you choose to use a spot cleaner, spray it on before washing and reapply wax to the treated area after you’ve dried the vehicle. 5. When rinsing, you don’t have to blast your car clean with the water hose. 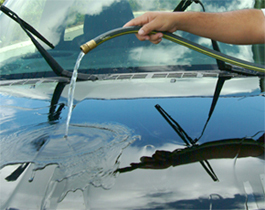 Free-flowing water (no nozzle) will allow the water to sheet off of your vehicle for a more thorough rinsing. Never skip drying! 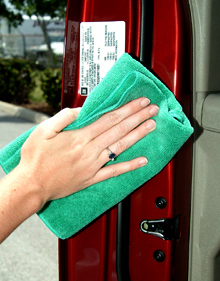 Drying your vehicle after washing is necessary to prevent water spots. Water spots are caused by mineral deposits that etch the outline of a drop of water into your vehicle’s paint. All water has minerals, whether it’s from the hose or the sky. As the water evaporates, the minerals remain on the surface and they will eventually, invariably create water spots. You can dry your vehicle in a variety of ways, but you want to make sure you do it quickly. The fastest way to remove excess water is with a California Jelly Blade. 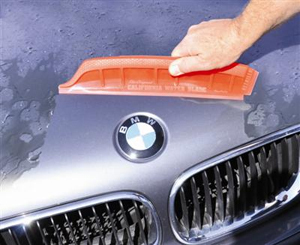 This is a “paint-safe” squeegee that pull 80% of the water off the surface of your vehicle. They are made of soft, medical-grade silicone so they will not scratch your paint or glass. Use the blade on the windows first, since water spots are most noticeable there. Or for aTOTALLY TURBO-CHARGED fast drying experience go with Metro Vac N’Blo for a flawless finish. This is the ultimate detailing tool, for clean up and dry down. This portable unit comes complete with a four piece micro-cleaning tool kit, shoulder strap and blower nozzle. If you use a California Jelly Blade you may still need to use a towel to wipe away drips from around windows and mirrors. The Guzzler is a large 20″ x 40″ microfiber towel that is manufactured with a waffle-weave texture. This weave increases the surface area so the towel can absorb more water. It can absorb 7 times its own weight in moisture, and it’s completely nonabrasive. Microfiber towels come in a number of sizes and they can be altered for a specific purpose. For example, the Cobra Waffle-Weave Glass Towel will clean and dry glass without streaks. Microfiber is more absorbent than terry cloth or chamois, and it lasts longer. Terry cloth towels are not recommended because the fibers can become matted and hard after repeated uses. They shed lint. They increase the chance of swirls. Compared to microfiber, they are not as absorbent and they don’t last as long. Never use bath towels that have been discarded from the house. They are probably not soft or paint safe. All Cobra Microfiber Towels are engineered to be LINT-FREE! You may also use a genuine or synthetic chamois. The Prince of Wales Chamois is 100% leather and it’s extremely soft. Its luxurious texture makes it a pleasure to use, but it will not last as long as a synthetic chamois. Do not continue using it after it becomes hard. 1. Dry the windows and mirrors first. A series of careful firm strokes with your California Water Blade will remove any remaining water. 2. Use the large The Supreme Guzzler to remove the majority of water from your vehicle. This towel measures 20”x 40” and it absorbs seven times its own weight in moisture. Go back over the vehicle with a smaller towel, like the The Guzzler(16”x 24”) to catch any water the large towel may have missed. This quick two-step process will leave your vehicle bone-dry and ready for wax. 3. Once the outside is dry, wipe down all your door jambs. Open the trunk and hood to wipe the jambs. Our Cobra Microfiber Starter Kit can get your vehicle dry and spotless with the best in LINT-FREE drying technology. 4. Dry your wheels using a towel or chamois that is designated just for this purpose. Don’t use this towel on your paint to avoid cross-contamination. You may also use this towel to wipe off surfaces under the hood. Wash this towel before you use it again. Use a spray wax or spray sealant like Mothers Showtime Detailer or Wolfgang Deep Gloss Spritz Sealant to rejuvenate the shine of your existing wax. Skip this step if you are going to apply another coat of wax. The ultimate in finishing detail kits is the Pinnacle –Wolfgang Souverän Kit; two premium brands come together to make the ultimate detailing kit. The Foamaster Foam Gun works with your water hose to deliver the soapy water to the vehicle. The Foamaster’s tip helps boost water pressure to put a little power behind the delivery. Pair this nifty tool with BLACKFIRE Foam Soapto create mounds of thick suds. If you want to add some extra gloss and protection after each wash, pair the Foamaster Foam Gun with BLACKFIRE Wash & Wax. This wax-infused wash cleans, shines, and protects in one step! Starting from the first shot, BLACKFIRE Foam Soap creates huge amounts of suds and foam, and in seconds your entire vehicle will be coated! The Tornador Air Foamer HP is a high powered foam gun that works with any air compressor capable of producing 60-90 psi. The Tornador uses very little water so it’s a good idea to hose down the vehicle first. Then let the foam fly! The Tornador create fluffy, air-filled foam. The Foam Cannon HP work with a pressure washer. The Foam Cannon HP blasts a mixture of water and soap through the tip at a high pressure to release a lot of grime immediately. This foam gun uses less water than a hose, but packs a lot of pressure. The foam produced is not as light as the Tornador, but it clings very well. If you’re taking all the precautions every time you wash your vehicle and you’re still getting spots and swirls, the problem may be the water. No water is pure. All water has minerals and most has some form of sediment. If your car shampoo (or hair shampoo) doesn’t lather well and your faucets and fixtures tend to turn green, you’ve got hard water. If water will not sheet off your vehicle and you’re constantly battling water spots, you’ve got hard water. Hard water is mainly caused by calcium and magnesium, which can be removed with a water softener. Sediment is another common enemy of any paint finish. Sediment is actually dirt and rust in the water line. Water treatment plants filter out sediment but more sediment can enter the pipes between the plant and your home. This is why household faucets have screens in them. If you have well water, beware. You most likely have sediment and hard water. 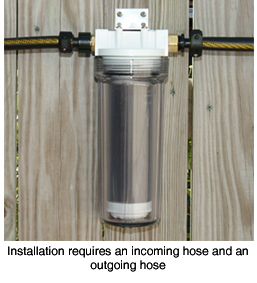 A Clear Inline Hose Filter will clean and soften the water before it reaches your vehicle. Connect it to any standard garden hose hooked up to an exterior spigot. Insert a 5 micron sediment filter or a water softener cartridge to address your specific water problem. The filter is easy to install and its cost is nominal compared to amount of time and money you’ll save on paint care. If you’ve got both water problems, get two hose filters so you can filter out sediment and soften the water before it exits the hose. The Deluxe Filter System includes everything you need to set up this simple, two-step filtration system. With a little preventative maintenance, your vehicle will rinse clean and have less water-related micro-marring. Check out all the great tools and products we have to clean your vehicle right on our Washing page!